After watching Terrence Malick’s last film, ‘Knight of Cups’, I said I’d never watch another one of his new films again, yet I’ve been drawn in again, and burnt once again. 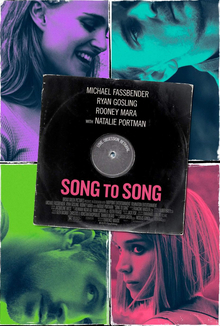 ‘Song to Song’ is not as bad a film as ‘Knight of Cups’ was, but it is still another dreadful film from Malick’s later period, where the frequency of his output has increased considerably at the same rate as the quality has dwindled. It’s loosely a romance drama set against the backdrop of the Austin music scene, following characters involved in the music industry to different degrees played by the likes of Rooney Mara, Ryan Gosling and Michael Fassbender. I can’t recall any of the characters names nor did I really care about any of them as they danced and spun through vapid and empty sequences that we’re supposed to care about I guess? At one point Fassbender impersonates a seagull, so there is that I suppose! The film retains many of the same trappings as Malick’s recent works from a story told in wispy voiceovers, choppy, frequent editing and a narrative that remains deliberately opaque. There are sporadic moments of insight in the voiceovers, but they’re infrequent and surrounded by such drivel that it’s hard to be taken in by them, and I found the narrative to be thin and the style really offputting at times. It’s not as bad as ‘Knight of Cups’ (wonderfully described elsewhere as like a bad (and long) perfume commercial), but the constant stabs at profundity fail badly with the undoubtedly striking visuals desperately attempting to cover for a sheer lack of substance in the material. Malick used to be a phenomenal filmmaker and his first three films remain outstanding (‘Badlands’, ‘Days of Heaven’ and ‘The Thin Red Line’) but his past few films have been infuriatingly banal. He still attracts good performers and it’s hard to fault the earnest performances, yet it’s becoming harder and harder to justify spending two hours of your time to watch something so frustratingly incoherent and dreadfully dull. Yet Malick remains beyond reproach amongst many, and you’ll find many people calling films like ‘Song to Song’ a masterpiece and saying that those who dislike it just don’t get it. They’re wrong, this is rubbish, and it should be avoided like all of Malick’s later work. He had a 20 year break between ‘Days of Heaven’ and ‘The Thin Red Line’, and on the evidence of his past four films he could do with another break, hopefully soon.